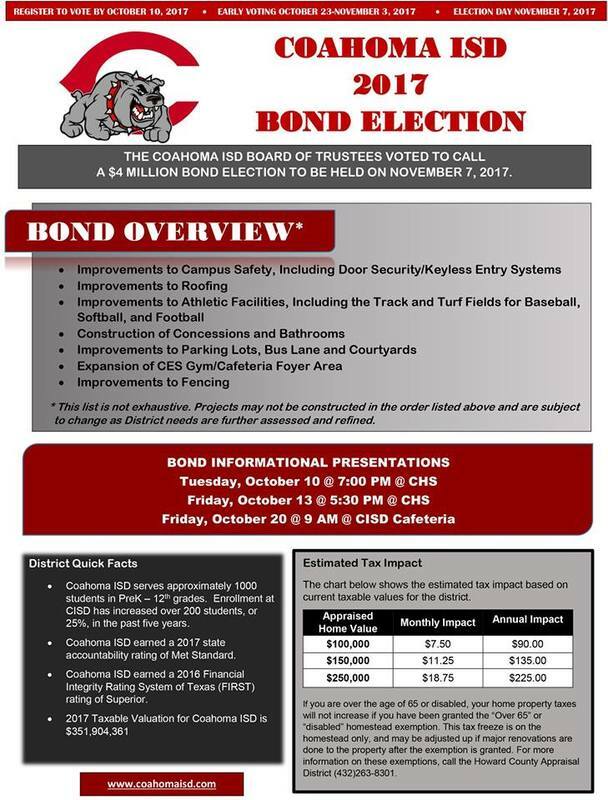 The last of three scheduled meetings over the upcoming $4 million bond election geared toward infrastructure improvements and the purchase of artificial turf for the football, softball and baseball fields will be held Friday, Oct 20, at 9 a.m. in the Coahoma ISD cafeteria. During the meeting, CISD Superintendent Dr. Amy Jacobs will give an in-depth presentation on how the money will be used if the bond is approved by the voters in November as well as the financial impact on property owners. If passed, the bond will add approximately $7.50 per month or $90 annually of additional taxes to a property owner who owns a home valued around $100,000. Taxes are expected to increase $11.25 per month or $135 annually for a home valued at $150,000 and $18.75 per month or $225 annually for a home valued at $250,000. All estimates are based on the district’s current taxable values. For property owners over the age of 65 or disabled, their home property taxes will not increase if they have been granted the “Over 65” or “disabled” homestead exemption. This tax freeze is on the homestead only, and may be adjusted up if major renovations are done to the property after the exemption is granted. For more information on these exemptions, call the Howard County Appraisal District at 432-263-8301. For more information about the bond, visit the Coahoma ISD website or call the administration office at 394-5000. Early voting begins Oct. 23 and continues through Nov. 2, on the first floor of the Howard County Courthouse in Big Spring between the hours of 8 a.m. to 5 p.m. The Howard County Election’s Office will extend voting hours from 7 a.m. to 7 p.m. on Oct. 31 and Nov. 2. Election day is Nov. 7. Voting will occur between 7 a.m. to 7 p.m.